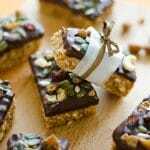 This healthy homemade granola bars recipe takes your favorite granola bar taste and flips it inside out...literally! Dipped in chocolate & topped with yums! Pop granola in the freezer for 30 minutes to firm up, then cut it into 9 to 12 bars. Melt chocolate (either using a double boiler or in the microwave) and transfer to a shallow dish. Gently dip one side of each bar into the chocolate, using a spoon to evenly coat it if needed. While the chocolate-coated side is still warm and melted, sprinkle on the trail mix. Store bars in an airtight container in the refrigerator for up to a week. Recipe from Live Eat Learn at https://www.liveeatlearn.com/inside-granola-bars/.